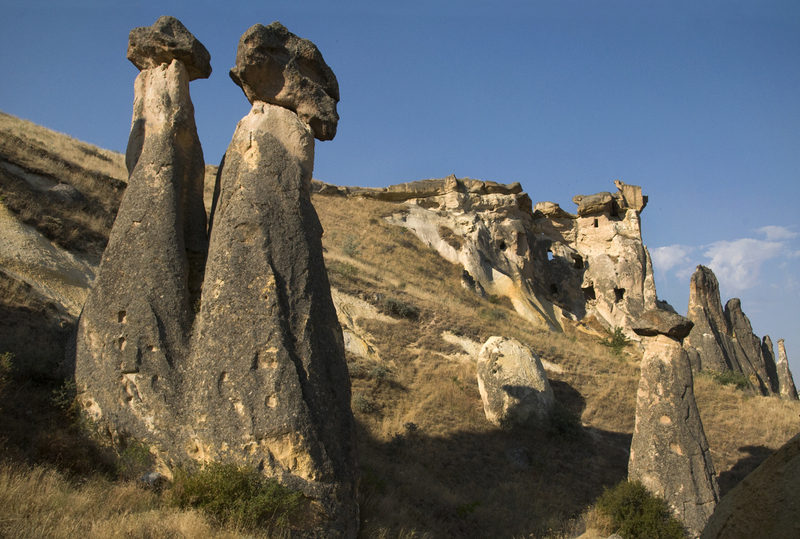 Cappadocia combines history and geology like no other place in the world. With its labyrinth of underground cities and multicolored rock formations that spiral into the sky, ancient civilizations have thrived in this arid desert landscape for more than 8,000 years. Best known as a refuge for Christianity before it was widely accepted, Cappadocia became home to early believers as they fled Roman persecution in the 4th century A.D. Over the next 600 years, these holy settlers would create the region’s most notable landmarks, carving out their homes and churches into soft canyon walls to make so-called “fairy chimneys” while building unimaginably complex beehives of humanity. Looking over the Cappadocia panorama, it’s easy to imagine George Lucas taking notes on the region before creating his own far, far away galaxies. 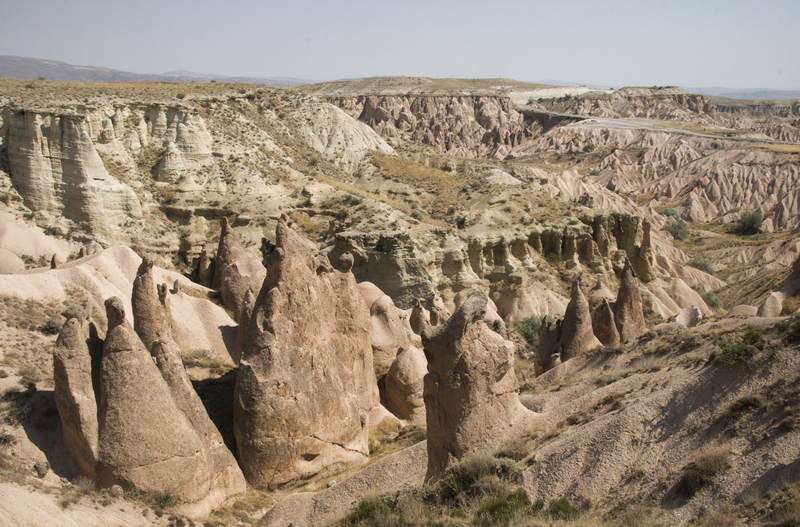 Still, Cappadocia isn’t a sci-fi fantasy. It’s here, on planet earth, and it’s fairly easy to reach for anyone willing to dive into the heart of Turkey’s Anatolia region. Tourism has boomed in the area since the 1980’s, and while there are plenty of all-inclusive bus tour packages, visitors can still rent their own wheels and create one-of-a-kind DIY adventures in this vast land of surreal antiquity. Most Cappadocia adventures begin in Göreme, a small town wedged between massive fairy chimneys located near most of the main attractions. 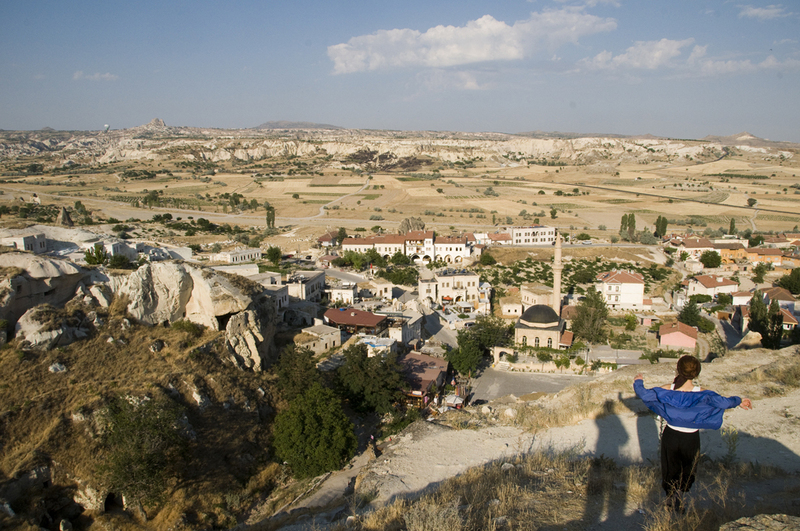 A popular destination, Göreme is the easiest place to sign up for break-of-dawn hot air balloon tours, a “once-in-a-lifetime” experience that costs about 150 euros per person. Here, visitors can also find a large selection of rentable vehicles. From dune buggies to 4×4 quads, little Vespa scooters and 1970’s Mustang convertibles. Basically, if you can imagine it, it’s probably available in Göreme. Being long-time budget travelers, Ania and I chose mountain bikes with a more manageable fee of 15 euros for 24 hours. For reasons beyond explanation, the bikes came with a stray German Shepard that would accompany us throughout our stay. We called her Efes. 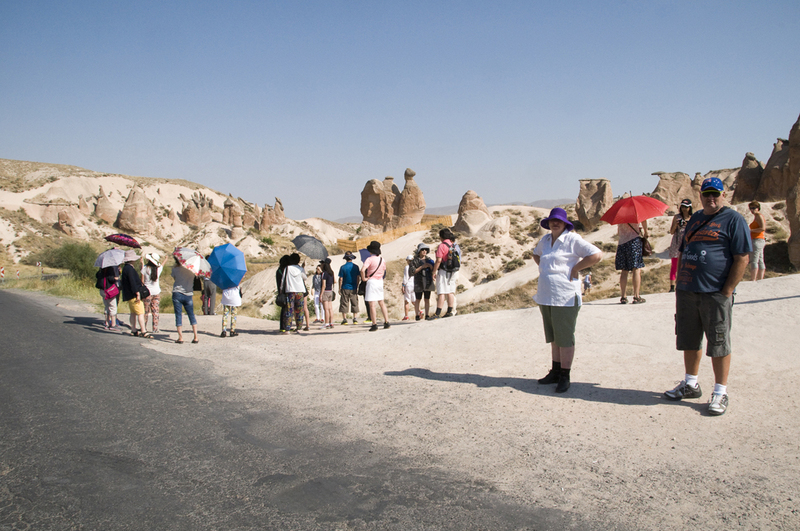 There is much to see in and around Göreme so we moved fast. Within 45 minutes of arriving, we pitched our tent at Dilek Camping, ate feta cheese sandwiches and headed out of town for our first bike ride. Efes trailed only slightly behind as we climbed a small mountain just above Göreme to get a view of the scenery. 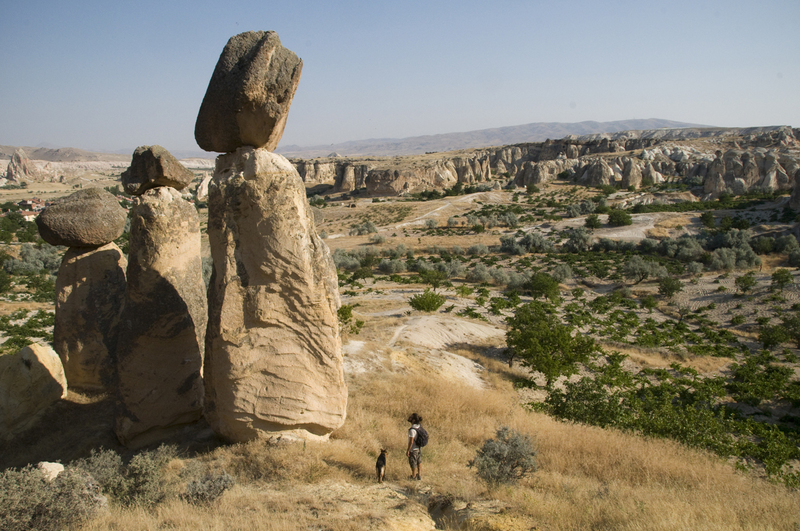 According to one of many tourist pamphlets in my pocket at the time, Cappadocia’s landscape was formed by the erosion of lava and basalt deposits from millenniums of earthquakes and rainstorms. The top layer of basalt was mostly volcanic ash that solidified into a soft, malleable surface, almost inviting the area’s first settlers to carve out dwellings in mountain sides and below the ground. On top of the mountain, Ania and I decided to grab a bottle of wine as the sun began to set over Göreme. While talking to a man in a small grocery, we asked what Cappadocia meant. “Cappadocia was originally called ‘Katpatukya’ which means ‘Land of Beautiful Horses,’” he explained to us before charging 5 euros for a decent bottle from a local vineyard. Ania and I drank it on a cliff, eating fresh apricots straight off the trees while the desert plateau became as purple as our lips. We needed to be well rested for the following day. 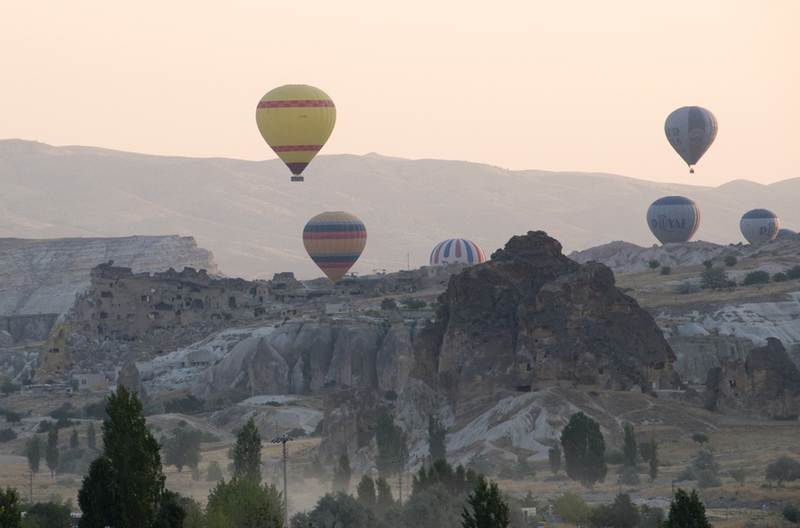 Dawn in Göreme is a symphony of blowtorches as hundreds hot air balloons launch softly into the orange skies. Beneath these floating orbs of rainbow, Ania and I began our bicycle circuit to Çavuşin and Ürgüp. 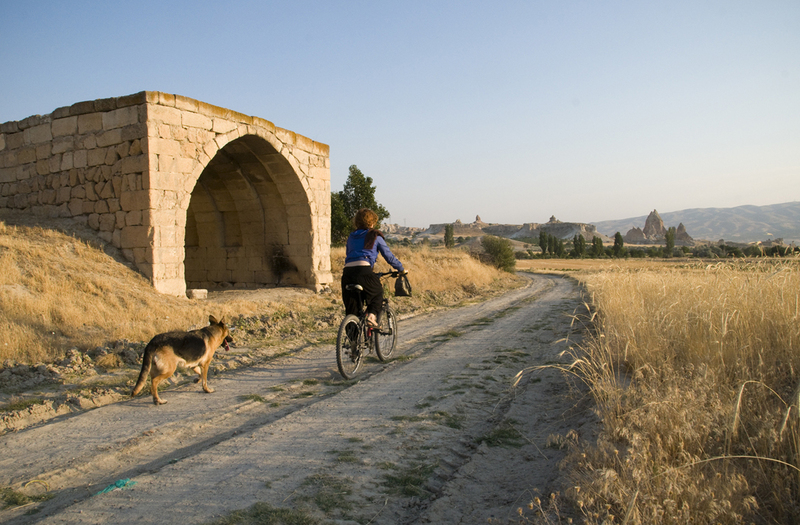 Efes, our trusty companion, slept outside the tent and followed the entire 40 miles, always trotting behind as we peddled through the Cappadocia landscape. 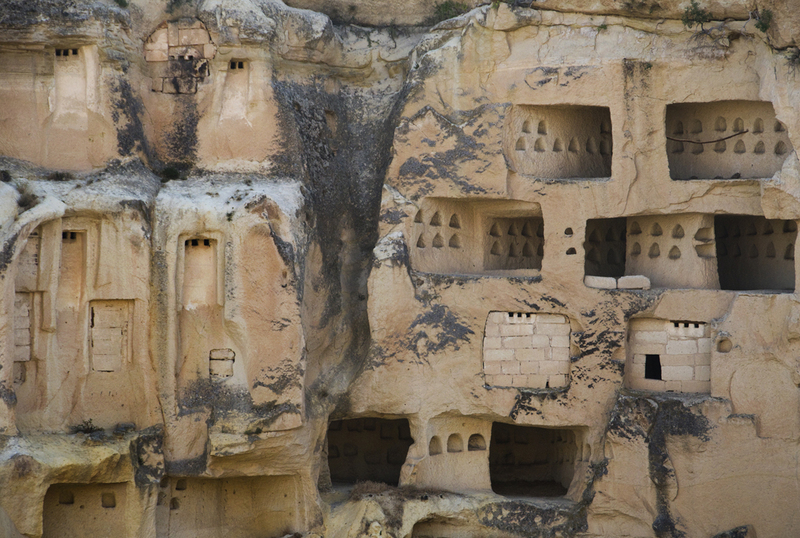 Just north of Göreme, our first stop was Çavuşin, a honeycomb city carved into a mountain ridge. We arrived before anyone else and enjoyed the site on our own, undisturbed by tour groups or souvenir vendors. Never before had we seen archeological sites that allowed visitors to climb inside ancient dwellings at their own free will and we took full advantage, exploring each church and pigeon coop without reservations. Çavuşin is best known for St. John’s Church, one of the oldest and biggest cave churches in the region, dating back to the 5th century A.D. On the city’s north face, there’s a nice trio of minarets topped with boulders and, towards the west, a small batch of secluded mountain dwellings look out onto the plateau. Afterwards, we passed through the Zelve and Deverent valleys, where natural rock formations play with the imagination, creating stone hands and animals that rise above the desertscape, inviting tour buses to stop every 20 minutes so travelers can snap a picture of themselves in front of a basalt camel rocks. We were told there were also attractions in Ürgüp, but by this point, Efes was about half-dead from running in the afternoon heat so our main focus was finding water for the poor dog. From Ürgüp back to Göreme, we scaled over a small mountain where the two tallest stone minarets stand near a giant Turkish flag at the summit. The area was packed with tourists and souvenir vendors so we continued towards Göreme to find, perhaps, the region’s main attraction. 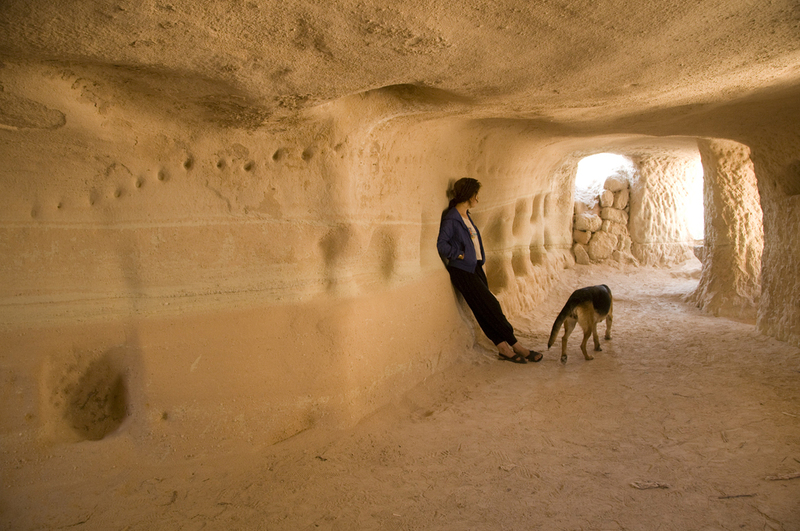 The Göreme Open Air Museum, just outside the city, is the most visited monastic community in Cappadocia. A dense complex of caves and ancient dwellings, the area contains more than 30 churches and chapels, some of which have well-preserved frescos from the Byzantine era, dating between the 9th and 11th centuries. Unfortunately, our bike rental clock was running out and Efes needed a nap, so Ania and skipped the Göreme Open Air Museum, leaving it for next time. We had been crawling in and out of caves all day in less trampled areas and felt satisfied with our above ground explorations. 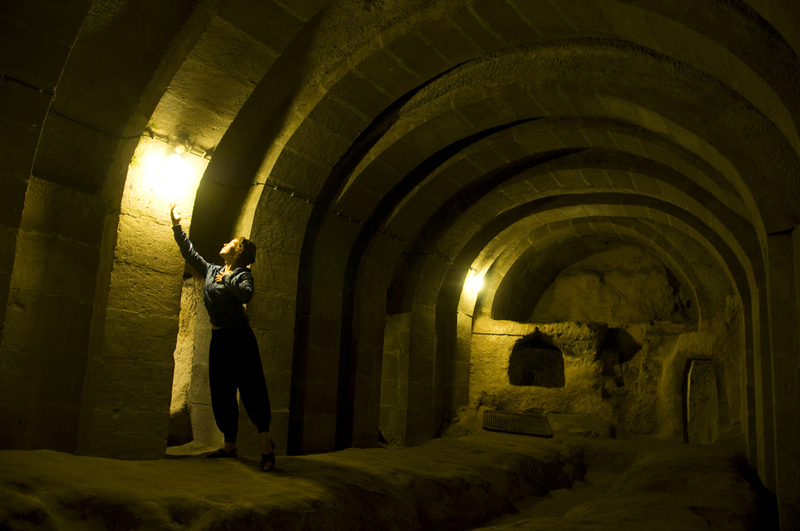 The time had come to visit Cappadocia’s underground cities. 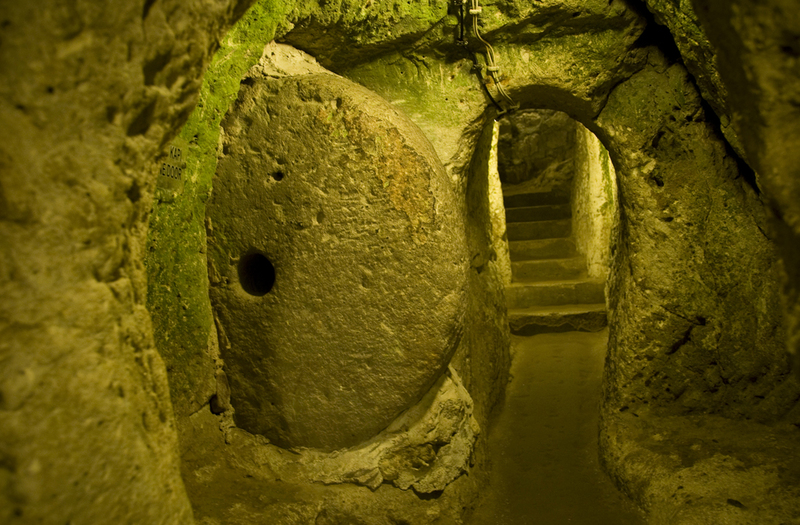 There are more than 200 underground cities in the Cappadocia region, the largest being Kaymaklı and Derinkuyu. Derinkuyu has multiple levels and a depth of about 200 feet. Archeologists say the city was large enough to shelter 20,000 people along with their livestock and food stocks. First built by the Phrygians in the 8th-7th centuries B.C., Derinkuyu was expanded to its present form during the Byzantine era. Following these long claustrophobic tunnels and staircases below the ground, one will find all the standard amenities of a normal city. There are stables near the entrance, storage cellars, meeting rooms, underground chapels and even subterranean wineries. After all, people cannot be deprived of pleasure in times of invasion. Large stone doors were designed to close off each floor in case of intrusion and miles of narrow tunnels were carved out to connect the underground cities with one another, offering residents escape routes when under heavy siege. 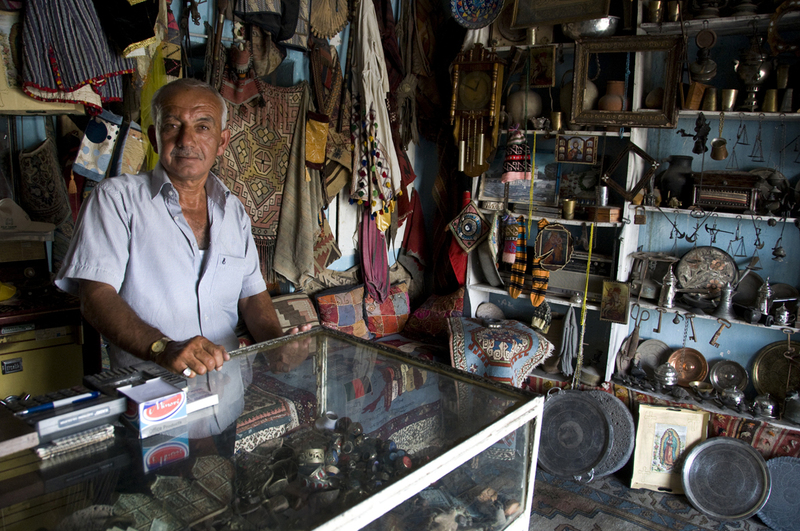 Lastly, I can’t forget to mention that above ground, Derinkuyu hosts a handful of authentic antique shop filled with rare Anatolian treasures where this fine gentleman sold Ania two sultan-sized jade rings. It was our last stop before giving Efes a can of florescent pink hot dogs and hoping on a bus to Antalya. 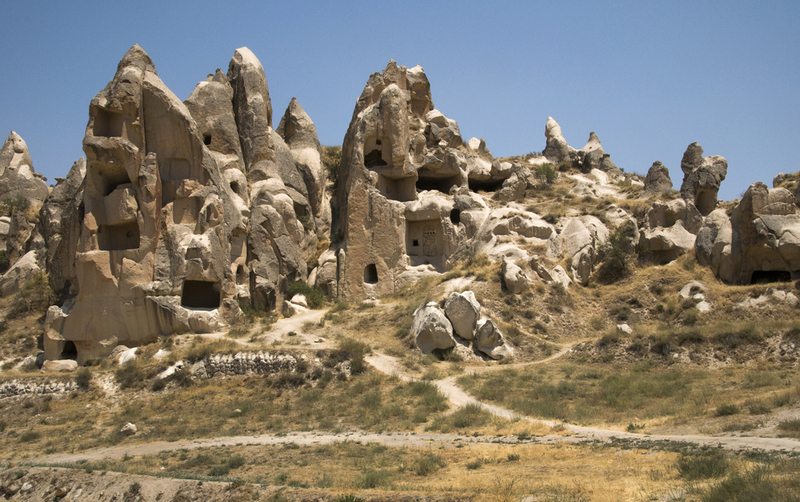 Despite the efforts of burrowed Christians and the Byzantine empire, Cappadocia was overrun by nomadic Turkish tribes from Central Asia between the 9th and 11th centuries. Muslim Seljuks eventually conquered the Anatolia region, forcing Christians west to modern day Istanbul. The Byzantines went on to suffer heavy losses, never to regain territories that once served as incubators for the western world’s dominant religion. 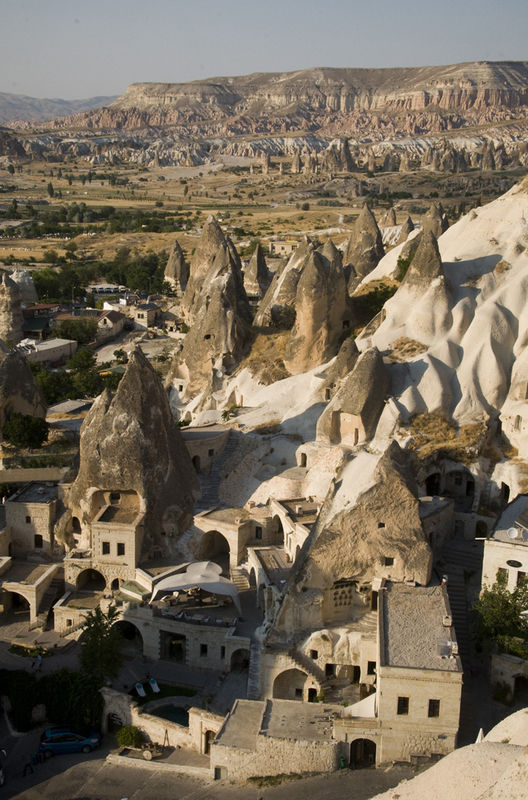 Viewing Cappadocia from above, an endless parade of stone minarets and vertical beehive cities, one is faced with the origins of a society, its will to protect sacred beliefs and its ability to survive in this rose-tinted Martian landscape. Somewhere between these odd geological formations, hidden among canyons and below the ground, one can see how far humans have come and to what extent they will preserve their cultures, regardless of opposing forces. 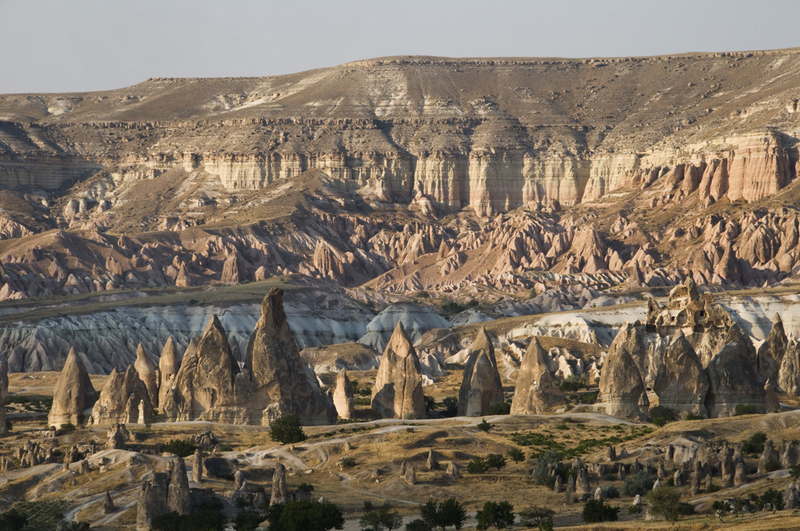 If this isn’t worth a visit to Cappadocia, then what is? Diego Cupolo is an independent journalist, photographer and author of Seven Syrians: War Accounts From Syrian Refugees. He serves as Latin America regional editor for Global South Development Magazine and covers international affairs as a freelance journalist, having reported on Syria, Turkey, Bulgaria, Nicaragua, Peru, Argentina and Chile. His work has appeared in The New Yorker, The Atlantic, Associated Press, The Village Voice, The Australian Times, Discover Magazine, UpsideDownWorld.org and Diagonal Periódico.